How incredible is the view?! 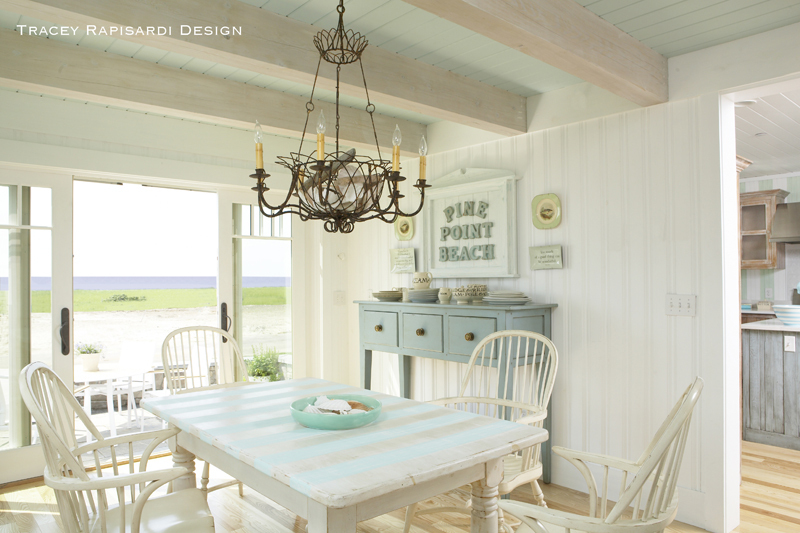 Loving the ceiling too painted Seaside Retreat Summer Sorbet (SR1011) by Valspar. 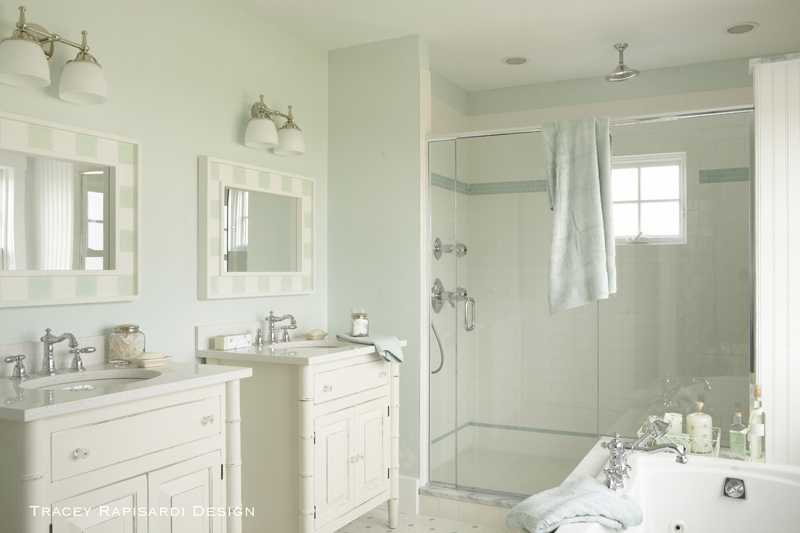 The spa-like bathroom is painted Martha Stewart Araucana Blue MS313. What fun to have a craft room! 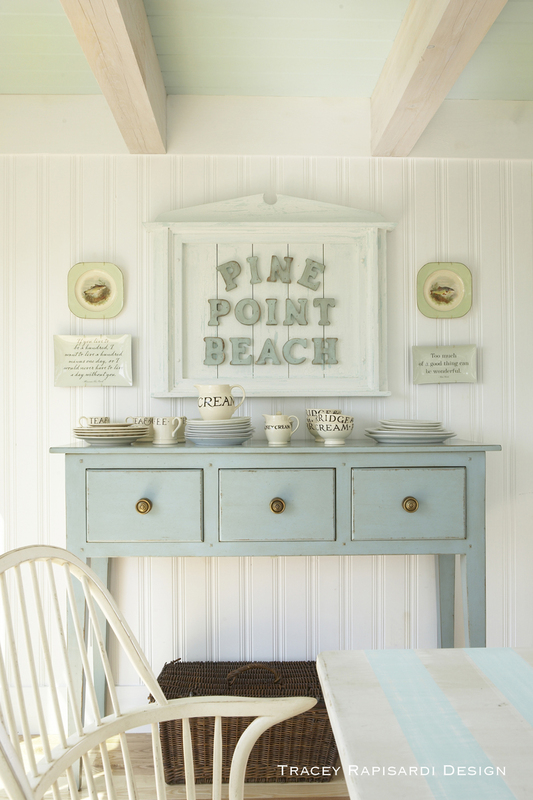 This one is painted Seaside Retreat Summer Sorbet SR1011 by Valspar. Next are some images I’ve yet to share on here but absolutely love. 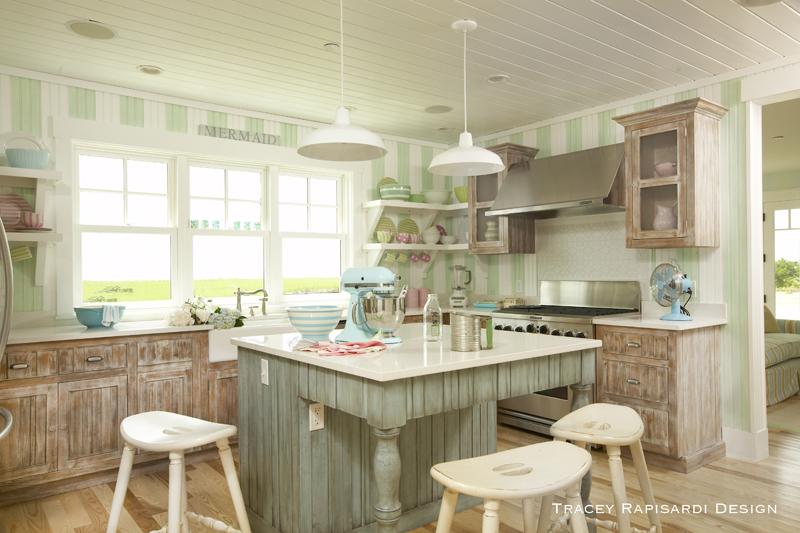 No one does turquoise and pink better than Tracey! Lastly I can’t forget to include the amazing Florida home that Tracey designed for her daughter Mandi. I’ll share just a couple photos of that, but be sure to check out the full tour with even more fabulous photos by Tracey Rapisardi here! Well there you have it…I’m sure you can see why this designer ranks as one of my favorites! 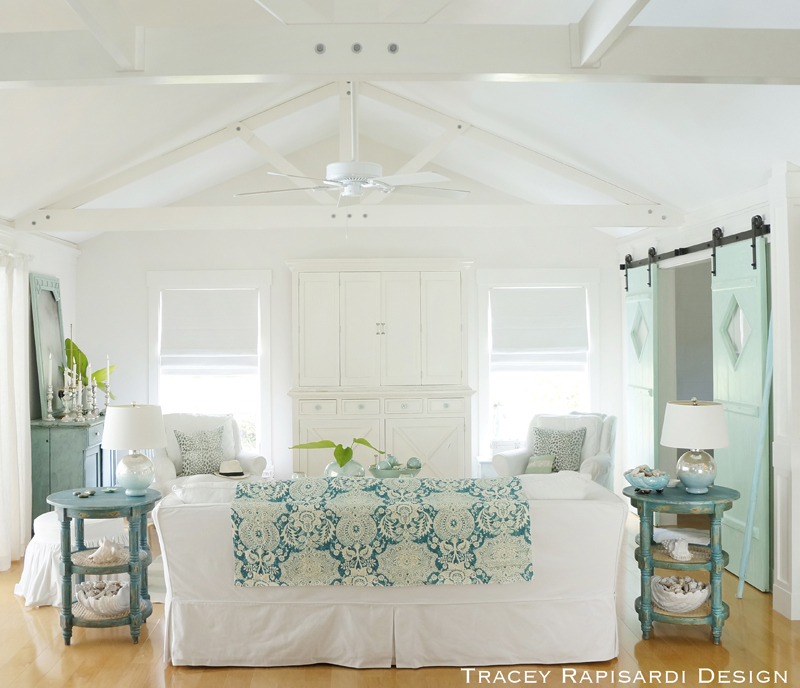 If there’s something above that catches your eye, chances are it’s available through Tracey Rapisardi Design–just contact them for more info. And if you’re lucky enough to be in the Sarasota area, a visit to her daughter Mandi’s adorable shop Summer + Company looks like a must. Their online store Sweet Summer has some beautiful things too! Be sure to check out all things Simply by the Sea or purchase it here! 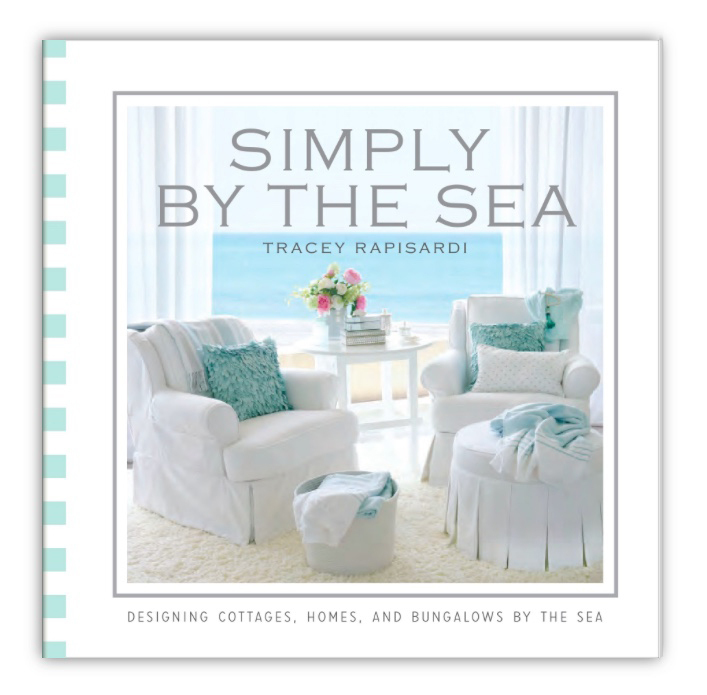 To celebrate the release of Simply by the Sea, Tracey is generously giving away a signed copy to one of my readers! To enter, just leave a comment below and let me know which space above is your favorite. I’ll randomly pick the winner next Wednesday 3/27. Good luck! I love the beach house in Maine! Such beautiful rooms and colors! I think that the photo area of the pink striped chair with the green cupboard behind it on the wall with the table beside is a perfect area for reading or talking on the phone or knitting. I love the entire house in Maine! This book looks amazing! I love all the photos you shared but if I had to pick one it would be the fifth photo. I love so many of the rooms, I am not sure what to pick! I can narrow it down to the bright, sunny living room with the white couch flanked by the two blue armchairs or the kitchen with the green striped walls. Thank you for posting such a love array of rooms. So hard to choose byt I think I’ll go with the spa-like bathroom. I love that Auracana blue! I love everything about the house! I just love the white kitchen with the scalloped wood valance. 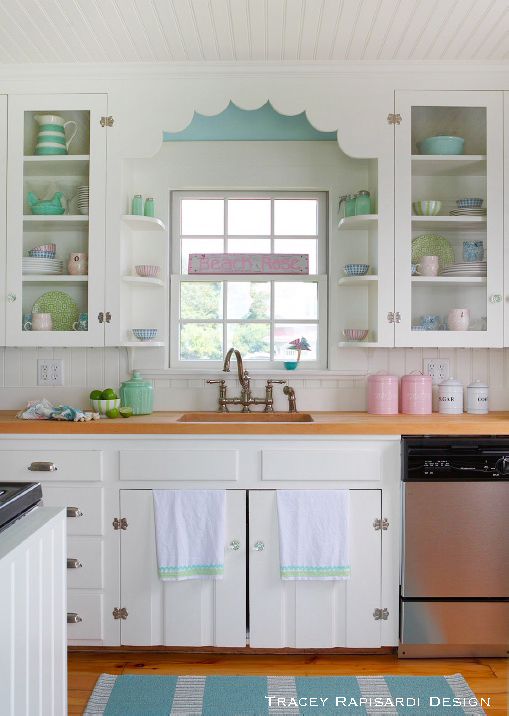 I love soft pastel kitchens, they are so pretty and light and easy to work in! I love everything she does but the dining room she designed for her daughter is my favorite. Cannot wait to see her new book! wow! it’s been quite a journey, Erin! Congratulations on 12 years of blogging about our favorite colors! If I had to choose just one image, it would be the one of the kitchen addition/screened-in porch – everything about that just whispers ‘relax’. 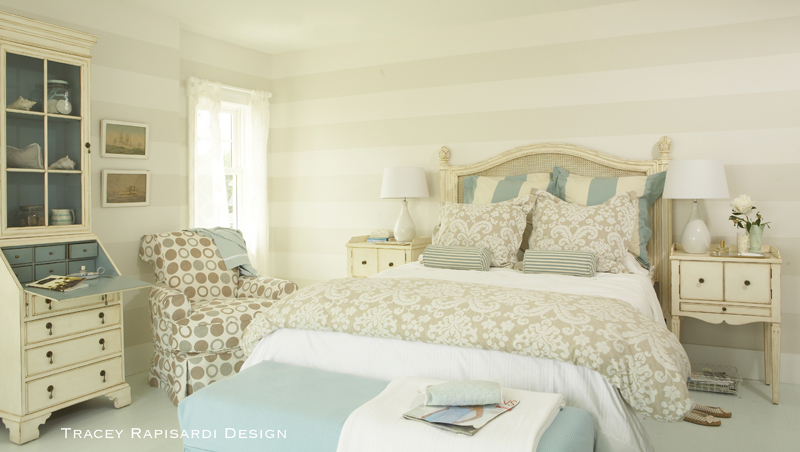 Lov e the craft room in the Coastal Living Idea Cottage of 2008! The color of the craft room is so pretty! Love it! Can I say All of them? I love the kitchens. I love that little built in desk nook underneath the window. Thanks for the giveaway! 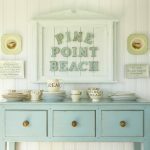 Just THE prettiest turquoise shades everywhere!! Ludos!! franki! Oh I’m all about that built-in banquette in the kitchen in the first photo – the spoon handles on the drawers!!! It’s all about the fun details. The table is adorable and love the beautiful muted blues in the fabrics there too. Would love to win the book, it looks amazing! Love the spa like bathroom! 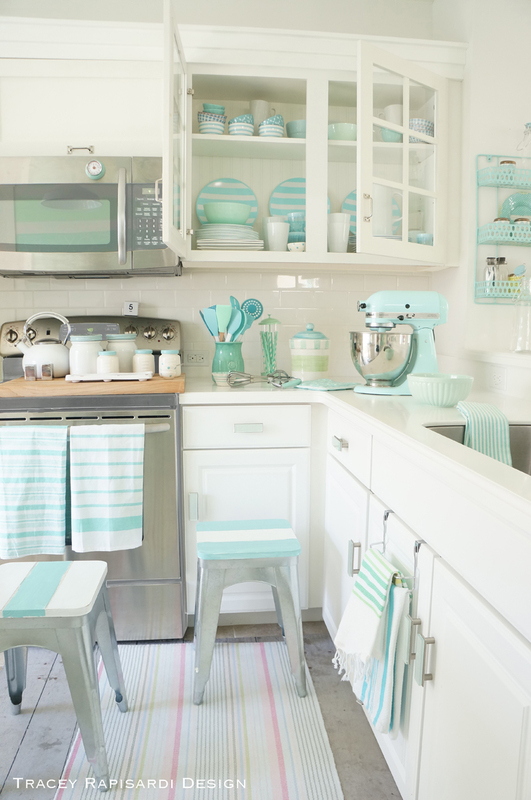 I LOVE it all, but the white kitchen with the turquoise accents and dishes is incredible! WOW! 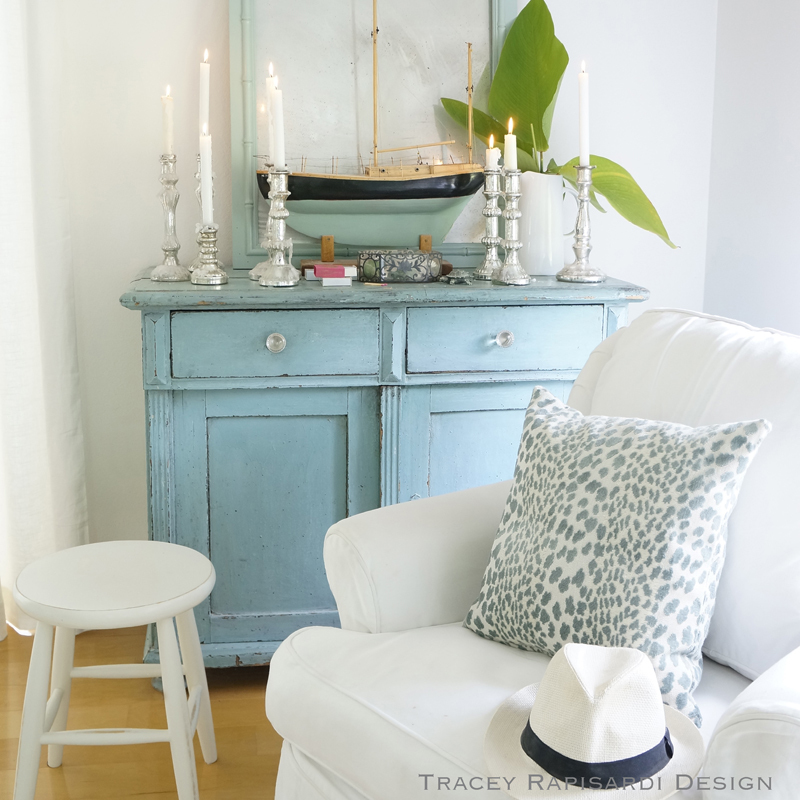 These photos of Tracy Rapisardi’s are truly inspirational and absolutely gorgeous! I would love to be the winner of the signed copy of her book, SIMPLY BY THE SEA! I’ve loads to work on to coastalize my own home and her work is so uplifting and encouraging! Thanks Erin so much for sharing! It’s good to have you back blogging! All of those spaces are just dreamy. I can not pick a favorite! 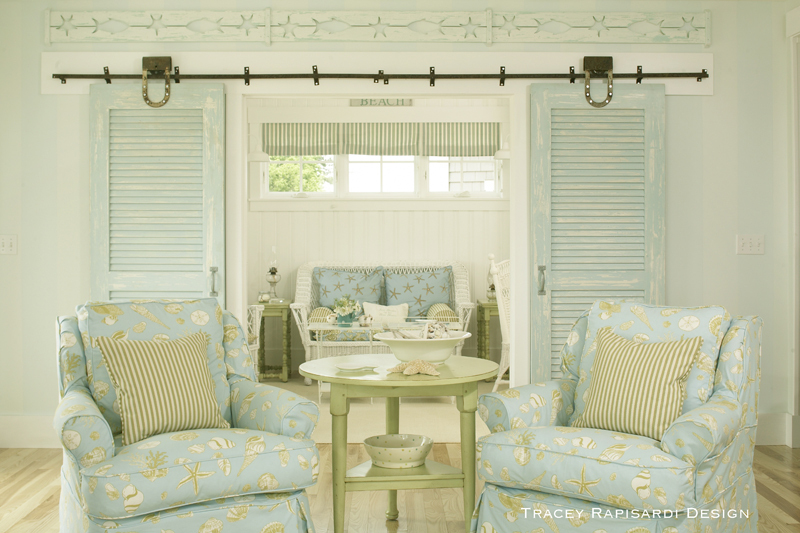 I love the Tracey Rapisardi dining room with three different pairs of chairs at the metal table, and the turquoise and mint floor. I’d love to win her “Simply by the Sea” book. Thank you. 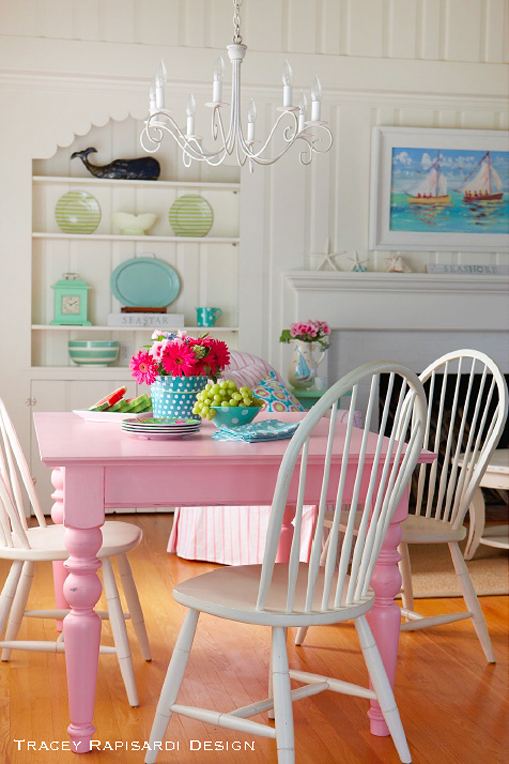 I love everything but especially that pink farmhouse table! Gorgeous. 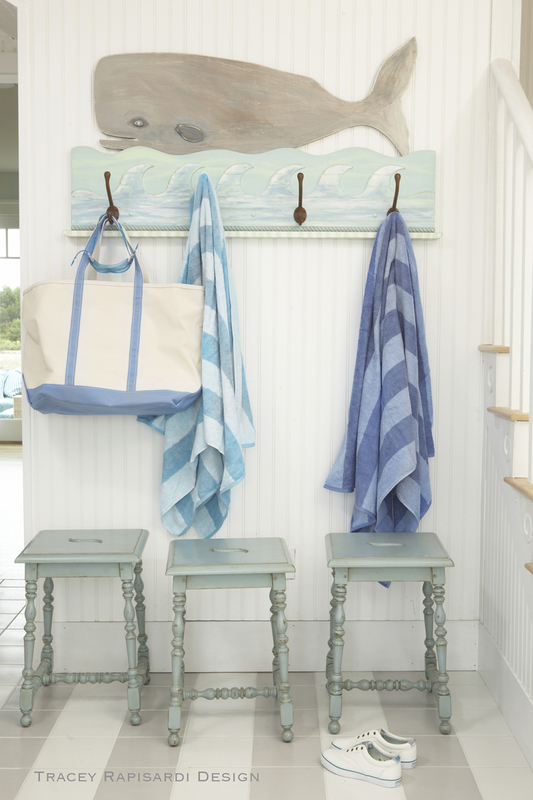 Love the beachy blue craft room! 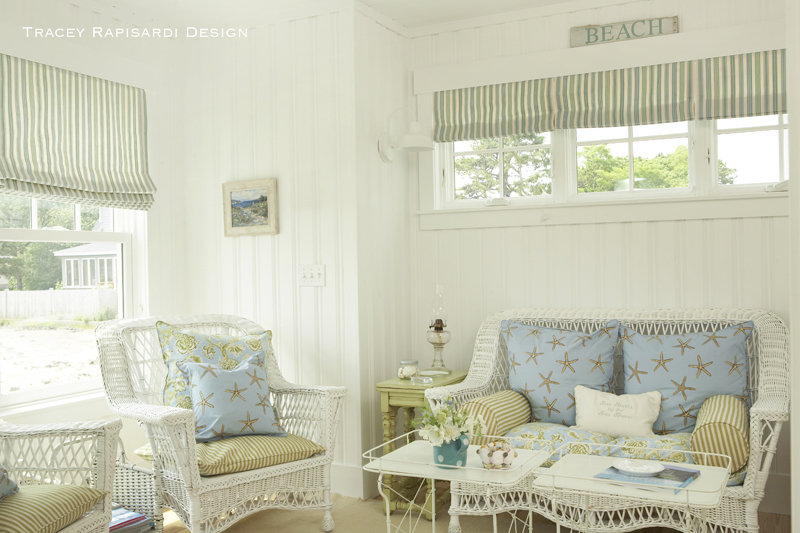 Love love the 2008 Coastal Living Idea Cottage and Traceys design! I want to be there! I love all the painted furniture and there are lots! I love the entry way with the whale coat rack. I would love to be able to purchase the whale coat rack. I would love to win the book. Gorgeous! I can’t stop drooling over Mandi’s kitchen! I LOVE this post! My favorite space is the banquet area with the colorful but subtle & soft colored platters on the wall! Love the idea of her book! Would be a pleasure to win! Which room do I like best? 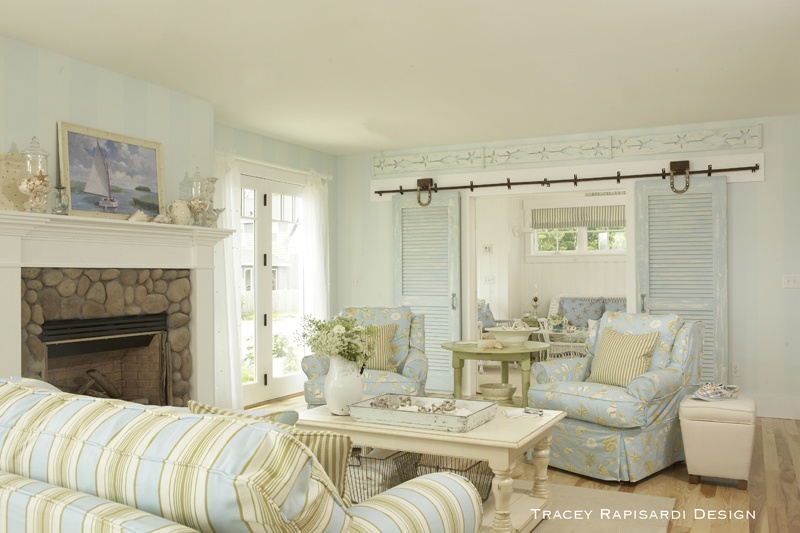 Any room you post that is labeled “Tracey Rapisardi Design .” True, but I do like that first room,,,the little, round, distressed tables and the turquoise barn door,,NICE! 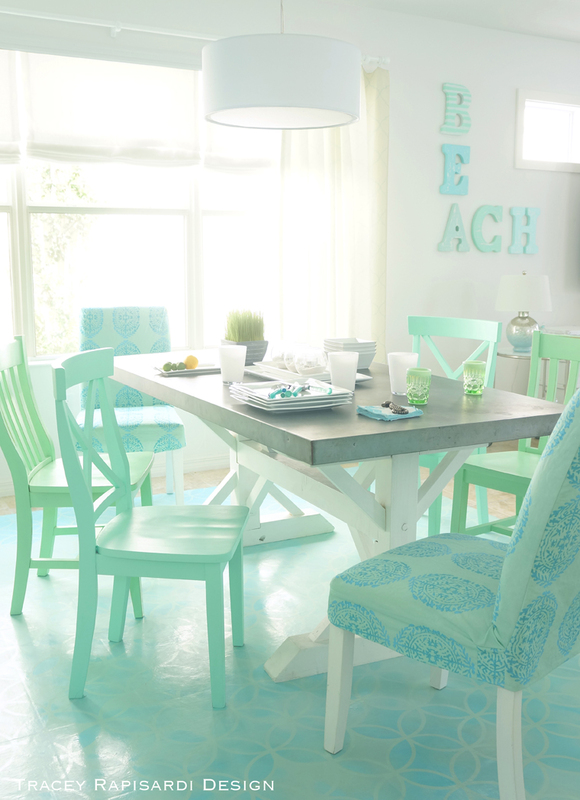 I am in serious love with that gorgeous room with turquoise chairs!! Honestly I love all her rooms! 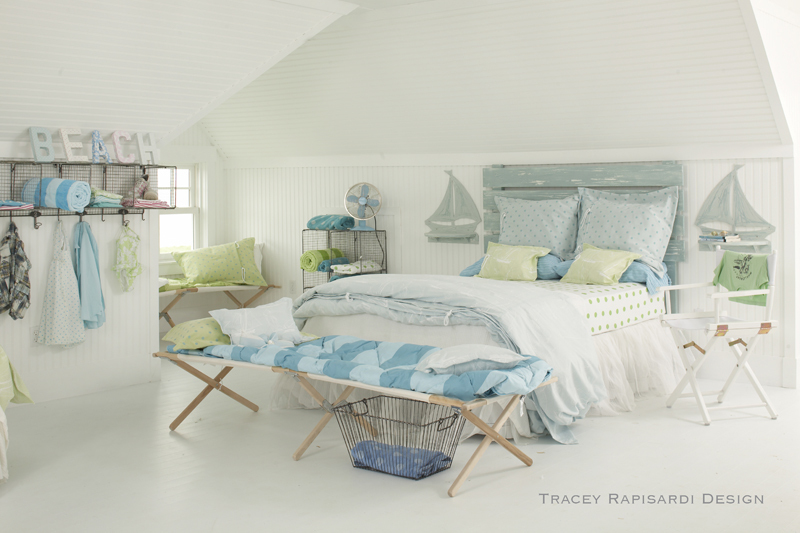 I love this website, and the Tracey Rapisardi designs are breathtaking! Thank you for sharing with the rest of us. Although I would be in heaven to live in this house and get to experience every room – my favorite is the children’s bedroom with the wire shelves on the wall and the tent in the corner. What a fun, cozy and inviting space to have a bunch of children spend the night! I live by the beach so this is always my favorite decor. The Southern Living Idea House. Love all the various shades of aqua. Gives me ideas for my cottage home in the stages of an update. I like the table with the different color chairs with the fun flooring! So pretty. I want to do something similar for our house. I just love all of the rooms ! I love the spa bathroom. Makes me want to start changing up my whole house. We live near a lake but I can pretend it’s the sea! Do I have to pick one favorite? If so, then I’d have to say the bathroom. It’s basically my dream bathroom! I love the first image best – relaxed and yet sophisticated – just gorgeous. I just love the sweet little booth-style dining nook! The kitchen photo with the turquoise KitchenAid on the counter. The craft room is my favorite. The card twirly thing is so cute to display cards and art projects. I am a stamper, I need to find a twirly stand. Any ideas??? Keep up the fun posts and blogging. Love the eating area on the porch! Everything about it is perfect….love the green doors! They are all beautiful, it was hard to choose just one. But I love the entry way whale hooks with the little stools. I have never seen that done. Usually everyone goes with a bench. So cute and creative. The Florida home is my fave! That kitchen is super cute! So Gorgeous with all the colors, just perfect! Love the large windows ~ Beautiful. You have done an AMAZING job! I have to choose a space, ack! Ok, the craft room. The whole house is so light and airy. Love it. Every room is a favorite! So hard to choose but I love that little breakfast nook! Can’t wait to see more from this book. 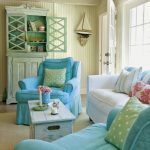 I love the living area with the 2 over stuffed turquoise chairs with the lime poka dot pillows. They’re all beautiful and inspiring but I especially love the built in dining nook because we’re planning one of own. I love the fresh kitchen with its chopping block counter and scalloped cutout above the sink. 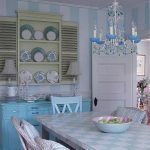 The glass front cupboard doors on top are a fun way to show off all of your darling serving pieces and the colored glass knobs on the bottom cupboard doors add a little “sea shine” to the kitchen! How can you pick just one? I think the breakfast nook has me. So cozy! 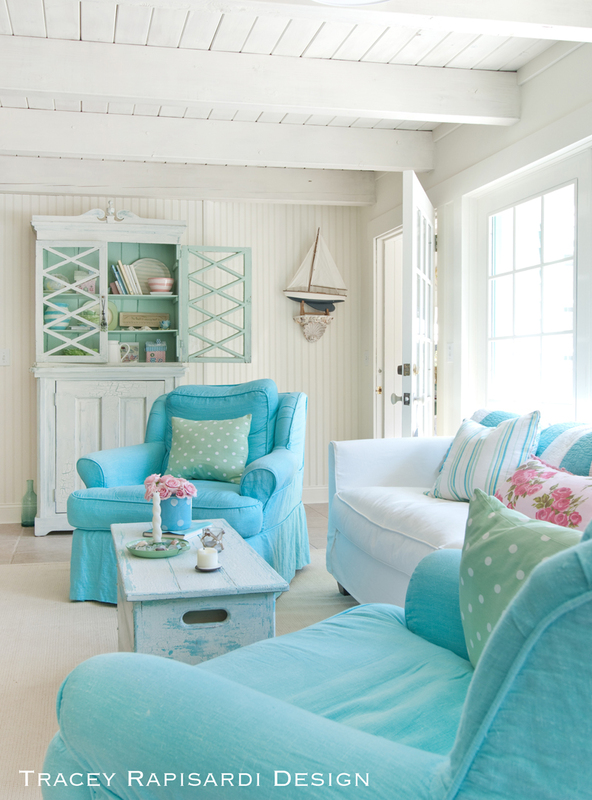 My favorite room is the living room with the sea in the background and the blue bowls in the foreground, LOVE! Congratulations on your new little girl and welocome back! Yes! I’ve also been a big fan of Tracey’s design for many years. So exciting to hear she has authored a book now. My favorite image I’ve seen so far would be the sofa overlooking the water. Is it the Gulf of Mexico? Blue never gets old, and neither does really beautiful design. Luckily for all of us Tracey just keeps on delivering her signature eye candy. Thanks for the update on what Tracey is up to, can’t wait to drool over every page. LOVE, LOVE LOVE it all. ESP. The blue club chairs. It is soooooo hard to choose. My whole house is blue. You are my inspiration! 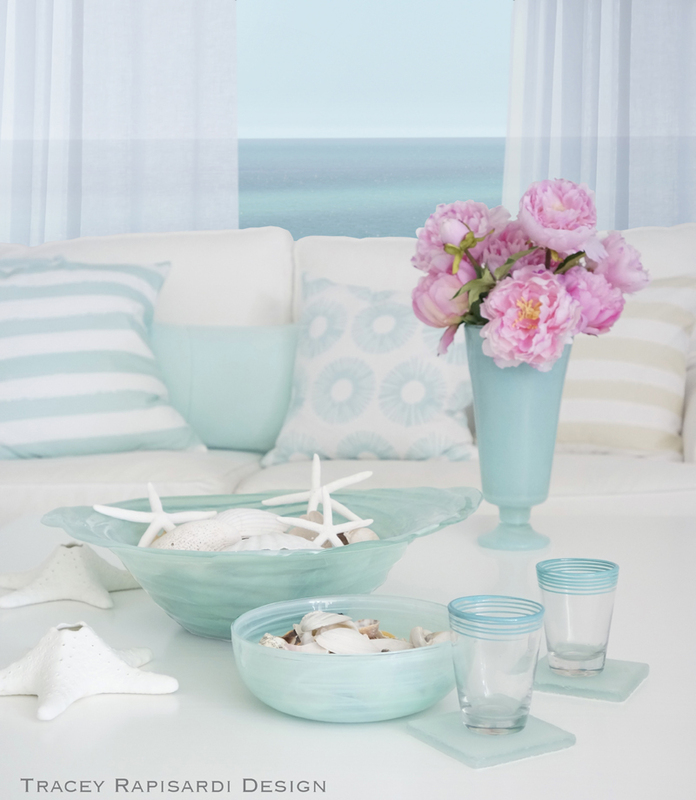 The room with the aqua dishes, and pink flowers and the view of the ocean! Dreamy! LOVE the pic of two blue chairs, white sofa, and that POP of hot pin k flowers on the sofa pillow!! Oh so hard to pick a favorite spot in the house, it’s all beautiful but I absolutely love the living area with the sliding shutter doors! Thank you for this awesome post and giveaway! Wow, so hard to pick just one, I love them all. The Front Door invites you in, I like the room with white sofa and floral painting, the Master Bedroom and closet. Love the craftroom. What a calm, organized space to work on all crafts. The livingrooom with the turquoise sliding doors .. so tranquil. My favorites are the breakfast nook and bathroom. I loved every single picture! Would love to win the book! I love the blue couch with the pink pillows! 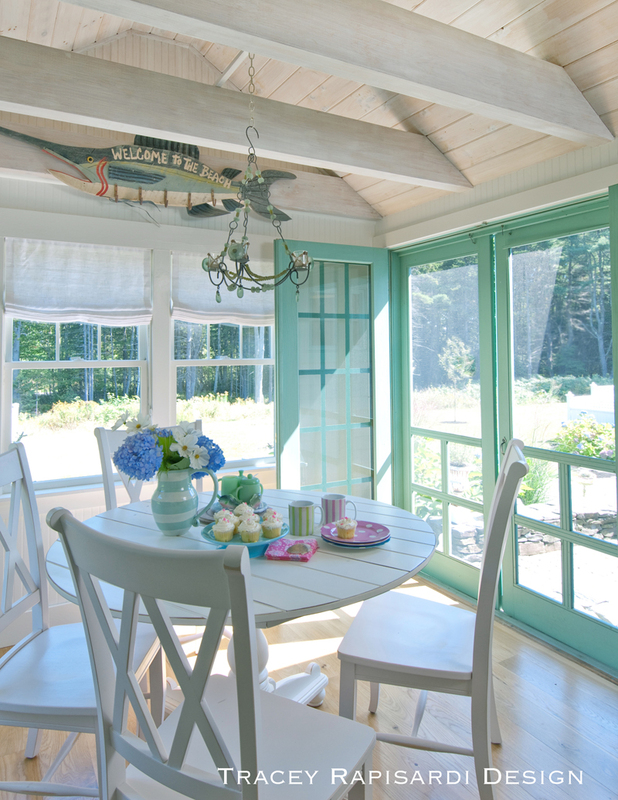 I think I love the sun porch with the turquoise double screen door the best. I would LOVE to have this in my house. So hard to pick a favorite, they are all A-MAZING! 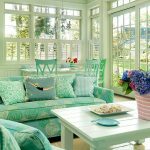 I think I’d choose the first Living Room, those soft turquoise barn doors with the diamond panes – love, love, love, the side tables – drool worthy and the cabinet – to die for!! Yep, I’d move in right now!!! Oh my goodness! How do you pick a favorite? All of the rooms are wonderful, cheery, welcoming, warm and interesting. I do like the sun-room with the screen doors to the outside, that just beckons friends to share an afternoon tea… Honestly, all these rooms are truly lovely. I’ve always loved the Scarborough house Bunk room! I would love this book too! I love the living room with the staircase. Super cute. I really love the Spa-like Master Bathroom painted in the lovely Martha Stewart Auracana Blue…so light and airy and relaxing! All of Tracy’s work is beautifully done, and owning her inspirational new book would be a wonderful addition to my collection of design books! So cheerful, a place to chill and enjoy the sights snd sounds of a beautiful garden area. Thank you for sharing. Oh my! Hard to pick just one, but I’d probably say the craft rom is my favorite. Love all the light ! 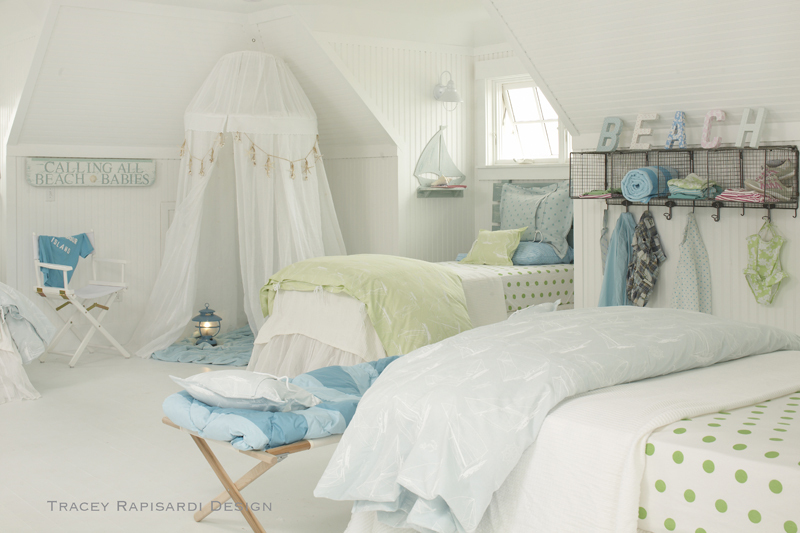 Love the bedroom with the canvas cot at the end of the bed! So simple, but what a statement! I love the kitchen. Since my brain injury, I find that turquoise is a comfort color. Love your collection of photo’s. Love this design so much! The house I want to spend a whole summer! I’d love to live in every room! 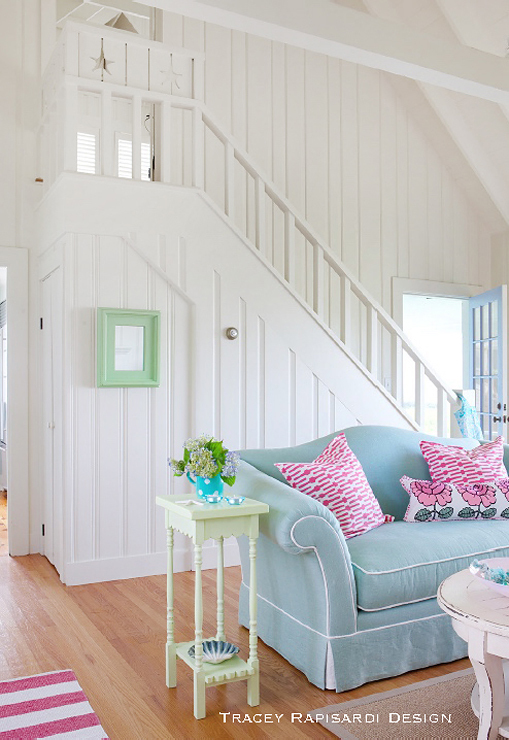 My favorite space is the staircase with the bright sofa and the periwinkle door. Congrats on a beautiful book! great .. design I love it..! I love the office/project space. Love all of the designs. Such playful color combinations without being over bearing or too fussy. When I look at your rooms they all take my breath away. I actually get a soothing feeling inside. You are an amazing designer. Thank you for sharing your talents with us.